To purchase a tent please contact your local Hilleberg Dealer or, if you are outside of the United Sates, the distributor in your country (Click here for a list of dealers and distributors). If there is no dealer in your area or distributor in your country you can order directly from us. Because we have dealers in the following countries, we do not ship to any European country, or to Chile, China, Hong Kong, Japan, Korea and Taiwan. Click here for shipping rates and options. Online orders can be placed using Visa, MasterCard, American Express, and Discover. Please contact us if you would like to use a different payment method. 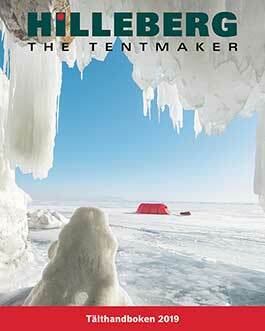 Hilleberg tents and shelters have a lifetime warranty against defects in material and craftsmanship. Any defect in materials and workmanship will be repaired or replaced at no cost. Damages due to improper handling, accidents or general wear and tear, including effects from UV-exposure and sand, are not covered under this warranty but can be repaired by us at a nominal cost. Click here for more information about our warranty and our repair services. En cookie är en fil som skickas från en websida, t.ex. www.hilleberg.com, till din dator där den lagras antingen i minnet (session cookies) eller som en textfil (textbaserade cookies). Cookies används för att lagra inloggningsinformation samt din kundvagn när du surfar runt hos oss. Om din webbläsare är inställd på att inte acceptera cookies kommer du inte ha möjlighet att göra någon beställning i vår webbutik. Du kan lätt ändra detta under inställningar i din webbläsare. Observera att vi inte använder cookies för att spara personlig information om dig.